1. Increased possibility of receiving a gunshot wound. 2. Larger caliber of round or rifle fire expected. 3. Longer delay for surgical intervention. 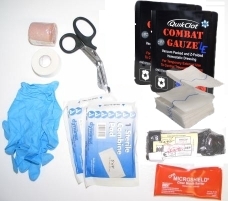 The difference between this kit and our other Gunshot Wound Kits is that this kit contains two packages of Quikclot Combat Gauze LE, a Combat Application Tourniquet (CAT), which is designed to be self-applied, and a Velcro/Molle adapter. 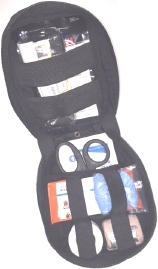 The Enhanced Gunshot Wound Trauma Kit is contained in a nylon Molle style Medic bag so it can be easily carried in a shooting bag, duty bag, on a belt or attached to any Molle type system. The included Velcro/Molle adapter allows this Kit or any Molle style item to be attached to a surface with Industrial Strength Velcro or attach more securely to a duty belt. The Enhanced Gunshot Wound Trauma Kit is designed to treat Life Threatening Traumatic Emergencies such as gunshot wounds and knife wounds which could become fatal prior to the arrival of EMS in 5 to 15 minutes. Each Enhanced Gunshot Wound Kit will treat gunshot or knife wounds or other injuries with traumatic bleeding. It's not a first aid kit and is not intended to treat minor injuries. The tough, nylon Molle Medic case is 8" x 6" x 3"
It is recommended that persons using this kit be trained in Basic or Advanced First Aid and CPR and the use of Quikclot products. The manufacturer of QuikClot offers online and live training for their products. Education is offered for military, EMS/First Responders, and Law Enforcement. For training information, visit the Quikclot web site here. Replacement products are available to restock this Kit. Replacement products are also useful for training purposes, allowing users to train with the actual medical supplies without having to open the supplies in the Kit itself.